We returned to Seattle Saturday…four hours in the Lihue airport due to delayed flight…at 10:30 pm at the beginning of a big wind and rain storm. We had a great time with friemds Norman and Janet. 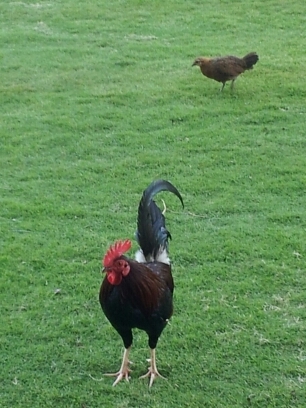 One last photo of a Kauai rooster. Yesterday I went to my first ukelele jam session! Welcome back home, ô weary travelers. And thank you for sharing your tribulations with your blog readers. It is now time to resettle in your own home, lick your wounds and arm yourselves with your pencils and other instruments of graphic description. You two are so blessed to be able to travel like you do! I appreciate your posts! Thanks.